Food delivery and takeout from your favorite restaurant, 24/7, 365 days a year. Postmates gets you what you want, when you want it. Order food to your door - from burgers to sushi, pizza and more. Restaurant delivery & takeout - 5 reasons you’ll love Postmates:1. Order delivery, takeout, and merchandise from 350,000+ local and national restaurants and retailers. 2. 300,000+ Postmates on the ground, ready to bring you anything.3. Real-time order tracking, keeping you updated on your restaurant delivery progress.4. Active in 2,900+ cities and counting in the U.S. and Mexico.5. Free delivery service on all orders over $15 with an Unlimited membership. FROM PIZZA TO SUSHI - GET ANYTHING YOU WANT Order food with just a few taps. From oven-baked pizza, fresh sushi or late-night desserts; one of our 300,000+ Postmates will deliver food right to your door. RESTAURANT DELIVERY OR PICKUP SERVICE - ANYWHERE, ANYTIMEWe’ll deliver food to your home, dorm, office, the park, or your next dinner party—wherever you’re at, whenever you want it. Skip the line and use Pickup to order food from a local restaurant near you. FAST DELIVERY Our delivery platform takes time and distance into account to ensure your order is assigned to the best possible Postmate, for the fastest possible delivery.POSTMATES UNLIMITED - FREE DELIVERY Join Unlimited for $9.99/month and you’ll get free food delivery on orders over $15. Love the offer? Save 20% when you sign up for an annual Unlimited membership. CUSTOMER SERVICENeed help? Our world-class customer service team is available 24/7. 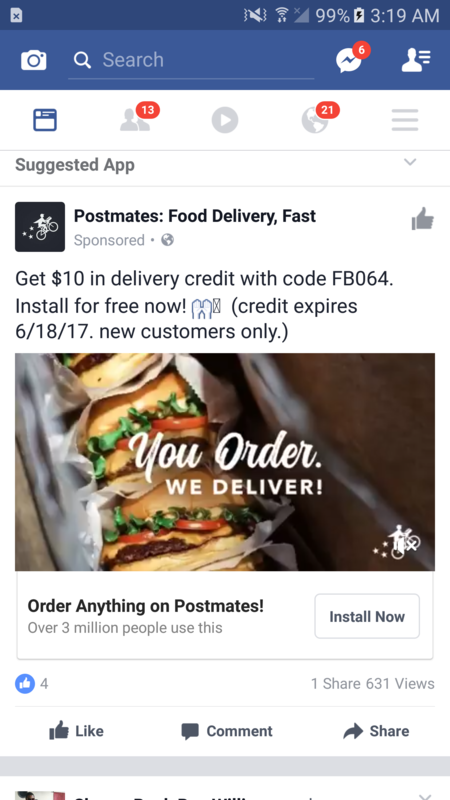 You can always reach us at: help.postmates.comNATIONAL PARTNERSJack in the Box, Shake Shack, By Chloe., Tender Greens, Blaze Pizza, Denny’s, PF Changs, IHOP, Walgreens, Chili’s Grill & Bar, The Halal Guys, Panera Bread and many more.ALSO GET FOOD DELIVERY FROMMcDonald's, Dig Inn, Wingstop, Wendy’s, Raising Cane’s, The Cheesecake Factory, Starbucks and many moreACTIVE IN ALL MAJOR US CITIESWe deliver food in Albuquerque, Atlanta, Austin, Baltimore, Bellevue, Boston, Brooklyn, Charlotte, Chicago, Cincinnati, Columbus, Cleveland, Dallas, Denver, Detroit, East Bay, Evanston, Fort Lauderdale, Honolulu, Houston, Indianapolis, Jersey City, Kansas City, Las Vegas, Long Beach, Los Angeles, Louisville, Madison, Miami, Milwaukee, Minneapolis, Nashville, New Orleans, Newark, New York City, Oklahoma City, Omaha, Orange County, Orlando, Palm Springs, Philadelphia, Phoenix, Pittsburgh, Portland, Queens, Raleigh, Sacramento, San Antonio, Santa Barbara, San Bernardino, San Diego, San Francisco, Salt Lake City, Seattle, SF Peninsula / Bay Area, St. Louis, Tampa, Tucson, Virginia Beach, Washington DC.AVAILABLE INTERNATIONALLYMexico CityWAYS TO PAYGoogle Pay, Credit Card, Debit Card. Major Credit Cards: Visa, American Express, MasterCard, Discover. All transactions are 100% digital, no need for cash.